“Would you like a bag of popcorn?” was what you hear when you first register. Then you learn there is only WiFi at the office, not in the park, as advertised. Next is the cable tv is not very clear and some channels are not available. They show trees on their website but they are only for the permanent sites. The maintenance crew is very rude and not helpful. And finally, the electricity goes on and off. Other than that, the popcorn was pretty good. Did NOT see any signs on I-75 for this campground. Did NOT see any signs on Hwy 40 either. Had I not asked when making reservations I'd have not found it. Not all travelers have a smartphone. Not a park for travelers with children; no playground. The pool had been filled in but was still shown on the park map given upon check-in; should be updated or at least crossed out until new maps are printed. The advertised WiFi was not operating at any time during our overnight stay. For those traveling without children, it was quiet. This happens to be on our route south at the perfect stopping length for an overnight. 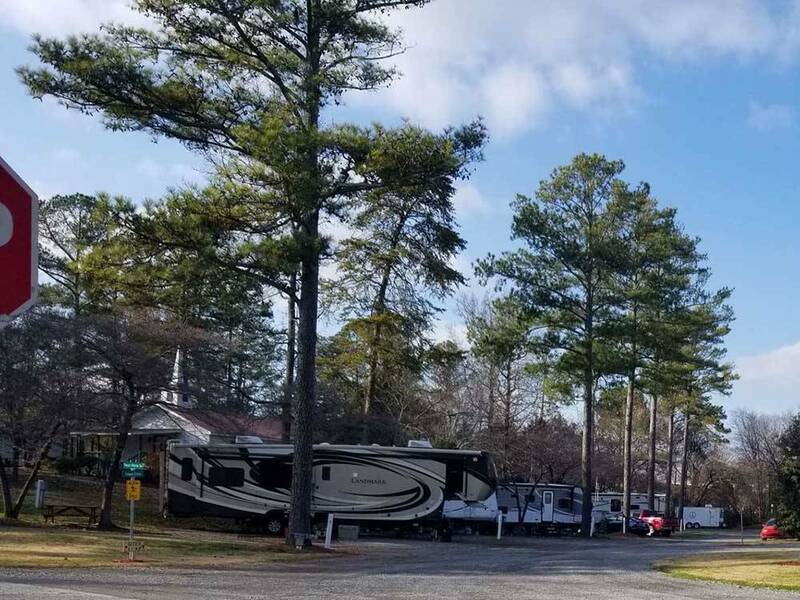 Not a resort style place, just a nice RV park run by nice people. We travel with two small dogs and did not experience any difficulties. Level lot and easy connection. Cable worked fine. Verizon hotspot weak here. Pull thru site did not feel crowded at all. Located near freeway, with slight freeway noise. Lots of shopping and dining near by. We've been staying at Harvest Moon just about every year since 1992. The new owner is a veteran and the majority of his staff are veterans. The park has enlarged to double its capacity with large pull thrus that are big rig friendly with easy in and out. Recommend Harvest Moon to all traveling I-75, you won't regret it. We stayed over Labor Day weekend and the only spot left was on the North end of the park. Several campers there had an "awesome" view of the back of an industrial trailer sales and repair shop, which was kinda weird, but ours WAS the last available spot that night. The South end of the park was more visually appealing but spaces were smaller and closer together. There were small some very small trees on our side of the park that will provide shade in about 15 years. The restrooms were older (70's era) but clean, and the shower knob worked backward (hot was actually cold). There is a game room for kids, but the rules and restrictions (adult must check out a key and be present) were such that no one used it, or at least not while we were there. The (A+) wifi signal strength is spectacular but there was virtually no bandwidth (D-) so...nearly useless. I am not really sure what their business plan is as there really aren't any attractions in the area and it is nearly an hour south of here to get to attractions/mall/shopping. I see this place as a decent one-night stop-over, but not really a "destination" resort. We stayed here for one night on our way to California. We felt welcome with our pets. Nice fellow at desk recommended great BBQ restaurant. Park is a few blocks fro I 75 but is quiet and easy to enter. Nice size sites and mostly level. Did not use WIFI. Good cableTV selection. Nice park and would stay here again. There is no pool,otherwise nice park. Serendipity comes in all forms: pristine, spacious, treed sites, very clean, quiet, friendly owners and free laundry. We arrived without calling first and found that they were all booked for the night. The owner was nice enough to offer us a spot in the old part of the park. This spot was ten times better then the place we had just left near Atlanta. We heard of the campground from some friends. LOVE it! When we are back in the area there's no doubt where we will be staying. Nothing extravagant but clean, quiet, easy on and off I -75 and very reasonable rates. Only thing I would suggest is that some work be done on the Wi-Fi. It didn't work at all for us. Plenty of places for fuel and a Cracker Barrel just across I-75. Didn't use rest rooms, the pool was closed but FREE laundry facilities. Never seen that anywhere before. Easy directions, off 75 go west not a half mile, turn left at Exxon Station and the campground is a couple blocks down on the right. A tip of the hat to the owners for recognizing the military. Means a lot when your a disabled Vet! VERY pet unfriendly. We checked in, and were asked if we had pets. We said yes,. After getting set up, we put an ex-pen outside our motorhome, as we normally do when travelling with our small Japanese Chins. Ex-pens are safer for the dogs than leashes on their collars. A campground employee came by and told us that pens are NOT allowed, and that we would have to carry our dogs to the designated dog walk area (half a block away from the campsite), as they are not allowed to do their business anywhere else. Their website has a brief pet policy statement, and did not state anything about carrying your pet to the designated area. The employee also said they had a 2 pet limit (we have more than 2), which is not stated anywhere on their website, or their printed material we were given when we checked in. Their employee was also totally unaware the campground even had a website. In fact, he was adamant that there was NOT a website. Well, duh, the URL is listed right here on the Good Sam site. This same employee also told us the park owners were considering banning all pets from the campground. If you travel with pets, avoid this park at all costs. In my opinion, they should be delisted from the Good Sam network, and should be shunned by everyone. We cannot say enough good things about this campground. We had a medical situation occur and had to leave immediately to return home. My husband was unable to drive our 5th wheel home. The owner and his wife went out of there way to help us store our 5th wheel and truck within there facility and told us we could leave them as long as we needed too. Campground and facilities were extremely clean and nice, and when we return we will be staying additional days. We highly recommend this campground to anyone. We would like to thank the owners for their help and generous hospitality.